Cross-border mortar shells from Syria kill one person and wound another near the eastern Lebanese town of Hermel. Cross-border mortar shells from Syria killed one person and wounded another near the eastern Lebanese town of Hermel on Monday. AFP reported that three mortar shells hit residential neighborhoods on the outskirts of the town in the Bekaa region, a stronghold of the Hizbullah terror group. A security official told the news agency that a 17-year old girl was killed and another woman was wounded by the shells. The latest incident came one day after two rockets exploded in southern Beirut on Sunday morning. The rockets hit the Hizbullah-dominated neighborhood of Dahiya, injuring at least four people. It was not immediately clear who fired the rockets, or where they were fired from. 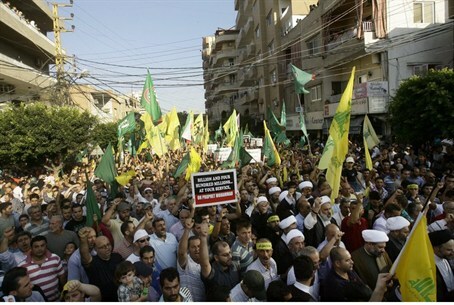 The attack may have been linked to Hizbullah’s heavy involvement in the internal Syrian conflict. At least 75 Hizbullah members have been killed fighting alongside President Bashar Assad’s soldiers, and Hizbullah head Hassan Nasrallah vowed Saturday to continue the group’s support for Assad. Lebanon's President Michel Sleiman cautioned Hizbullah on Friday over its fighting alongside regime troops in neighboring Syria. “The resistance is more noble and more important than anything, and should not get bogged down in the sands of dissension, whether in Syria or Lebanon,” he said in a statement, referring to Hizbullah’s strong stance against Israel. Hizbullah denied its involvement in Syria for some time, quietly burying terrorists killed in Syria. The movement stopped hiding its dead when its leader Hassan Nasrallah paid homage to terrorists killed across the border on April 30. Last year, as the ongoing civil war in Syria continued, Nasrallah publicly offered to place his terrorists at Assad’s disposal.